It is so funny seeing you in a car like that. 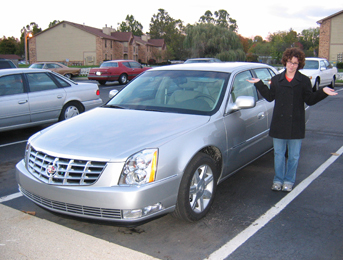 I picture older people driving a caddy. 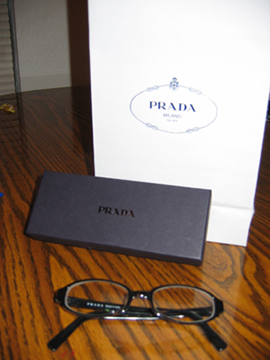 I love the frames though, they look great on you and they just happen to be Prada!!! It was the Pra. Da. That got you the car. They thought you had money and if they put you in a nice plush car you might upgrade. Then they can wholesale the old car and never have to pretend to fix it. sigh. I love the glasses! I've noticed many people wearing Kate Spade and Isaac Mizrahi glasses. Mabel is right...it was the P-R-A-D-A. But they look fantastic on you, LOVE them. And those pictures...OUCH! Everyone was alright? wait, if those glasses are supposed to last for two years (730 days) at a daily cost of $3, you paid over $2000??? buy yourself a prada purse for $300 and be over it! Hell no I didn't pay two thousand dollars! More like two hundred. I divided 730 days by 229 dollars. Was that wrong? Fab glasses. You are so IT, girl! No, you should have divided $229 by 730...so it's more like $.30/day. 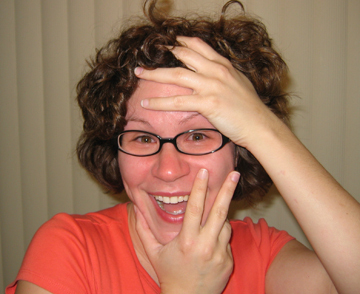 No worries though- I was just in shock that a pair of prada glasses would be that much! They ARE super cute, by the way! The glasses looks great on you. I would say they were worth it! Yes, I noticed that, too. Apparently, Frema thinks that what comes out of one is not as vulgar as the @$$ itself. You are freakin' hysterical, and SOOOO money.